Cloudy with periods of rain. Thunder possible. Low 46F. Winds NW at 10 to 15 mph. Chance of rain 100%..
Cloudy with periods of rain. Thunder possible. Low 46F. Winds NW at 10 to 15 mph. Chance of rain 100%. One thing I can say for sure is that I am no Chicken. I am referring to the former San Diego Chicken for the Padres baseball team. He is the team mascot that all others aspire to be like. Now known simply as “The Chicken,” he works independent of any specific team. I did a column about him a decade ago when I caught up with him performing at a Rochester Red Wings game. I still have his autograph from 1979. In my opinion, he is a comic genius. Don’t believe me? Then just look at videos of him on YouTube. I, on the other hand, found out firsthand how difficult it is to be an entertaining mascot. 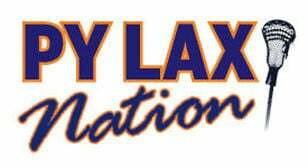 This week I’m marrying my weekly column in sports, PY LAX NATION (about all things Penn Yan lacrosse), with The Bigger Picture. I have often written about my fondness for the Penn Yan boys varsity lax program, and am happy to say I have been welcomed with open arms into the “family,” so I thought it might be fun to anonymously take on the mascot role for a game. I chose last week’s against Livonia/Avon, which was expected to be an easy win. Mustangs coaches are very serious, so I thought a blowout game would make me less distracting to them. That game turned out to be perfect; PY won 18-1. First, I informed Coach Brian Hobart; he had no problem with it. Then, I contacted Jon MacKerchar, the interim director of athletics at the time; he also was fine with it. In fact, he arranged for the costume to be waiting for me in the storage room adjacent to the ticket booth. MacKerchar did jokingly mention that he hoped I wouldn’t do anything that might sabotage his job. A school board meeting was being held the next day to determine the next director of athletics. I am happy to say Jon got the job. Dusty Blumbergs, who manages the Penn Yan boys lacrosse website and whose son Chase plays for the Mustangs, posted for fans to watch out for a “guest mascot” at the game. Mascoting, for lack of a better word, is not as easy as it looks — far from it. First off, the crowd was not that large for the weekday game. Then, because it was a rout, there was not much to get overly amped up about. My mascot stint might have been uninspiring for some. I think, at age 63, I am short on the required youthful enthusiasm. What turned out to be the best part of the experience was going into the stands and fence area where fans gathered. I was unaware that a student named Ryan is usually the school mascot, so most initially thought I was him, though I am sure my body language and walk are different. That is why, when I cruised up the bleachers to where school Principal Dave Pullen and his lovely wife, Sarah, were sitting, I received some curious looks. Maybe it was because I sat down right next to Sarah, possibly close enough to be invading her space, which I sensed through my costume’s hairy eyeball that I was getting the hairy eyeball right back. After telling them it was Spencer, they broke out into laughter. When I posed for a photo with Sarah, I was going to put my furry arm (a guess maybe a leg since horses don’t actually have arms?) around her shoulder. But truth be told, I didn’t know, given how culturally sensitive things are these days, if it would be deemed inappropriate. At halftime I reverted back to my role as newspaper photographer. Kim had already gone home when it was time to take off my costume. It was then I realized the zipper in the back was creating a problem. I now have a greater sympathy for women who routinely have to deal with this issue. The accompanying photos were taken by Dusty, except the one of me getting dressed, which was shot by Kim. I am not sure how many others have it on their bucket list, but I can now cross being a team mascot off mine. I also have a far greater appreciation for the work The Chicken, Phillie Phanatic, Bennie the Bull (Chicago Bulls) and Go the Gorilla (Phoenix Suns) do so effortlessly and so well. Showers and a possible thunderstorm in the morning will give way to cloudy skies late. High 69F. Winds ENE at 5 to 10 mph. Chance of rain 70%. R. A. Patrick Funeral Home, Inc.